Amazon, of course, has historically offered personalized recommendations in Kindle’s software as well as across its website. In its Kindle app, Amazon highlights books you may want to read based on your prior shopping history. Google Books’ recommendations will work much in the same way. The company says it will offer up new stories based on what you read on Google Books. However, it will also automatically suggest books that are mentioned in an article or mentioned in a video you watch, elsewhere in the app – like in the new “Weekly Highlights” section. This section within Discover will round up the most important news, reviews and videos of the week, says Google, while another new section called “Google Play Editorial” will point readers to other original content beyond books, including interviews with authors, essays from writers, other book selections from book reviewers and critics. Google Books today offers over 5 million books, notes the company, which makes its storefront competitive with both Amazon and Kobo alike, which offer roughly the same number of titles. 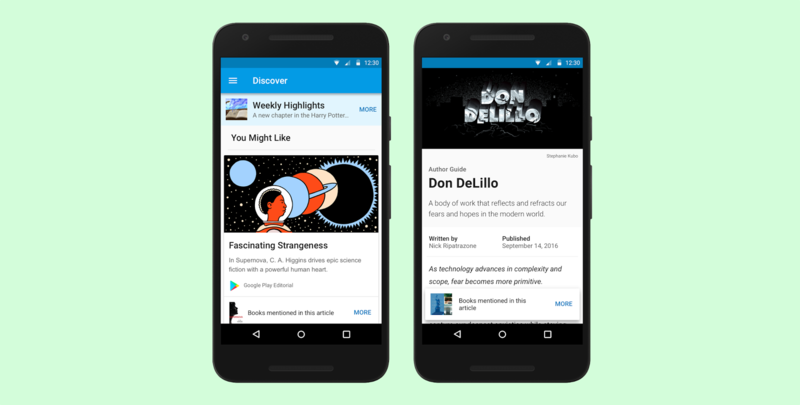 Google says that Discover is launching today in the Google Play Books Android app (in the US at least), and that it will soon be coming soon to iOS. You can download Google Play Books from the Play Store for free.